This is an article by guest writer Don Campbell of Expand2Web. Think of the greatest athlete, musician, artist or business professional that inspires you. The amazing talents that really stand out. Michael Jordan. Tiger Woods. Warren Buffett. They were each born with a special gift: wired from birth with talents and abilities that most of us don’t have access to, right? Research is showing that it’s not that simple. 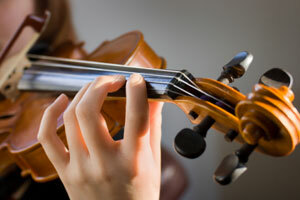 In fact, many child prodigies don’t go on to major success in the area of their early gifts. And many of the greatest performers, athletes and business people never showed any early signs of aptitude. So, how did they become great at what they do? A couple of years ago I read an article by Geoffrey Colvin in Fortune, What It Takes To Be Great. The article is fascinating and delves into the question of innate abilities, usually referred as “the talent myth”. Nobody is “great” without lots of work. Early aptitude is not a predictor for greatness in a given field without consistent practice over a long period of time. The most accomplished people in any field need about 10 years of hard work before they become “world class”. They call this the 10 Year Rule. Many of these scientists are now saying that “targeted” natural gifts do not exist at all. You are not born a CEO or chess grandmaster. Rather, greatness is achieved by hard, focused work over many years. Charlie Parker, widely considered one of the most influential of Jazz musicians, showed no sign of musical talent as a child. He started playing saxophone at age 11, and was thrown out of his high school band because he was so bad. But this drove him to practice intensively for many years, for four years up to 15 hours a day. It was many years after that before he was noticed. Tiger Woods started practicing golf at 18 months, and was encouraged to practice by his father. He had been practicing intensively for 15 years before winning the U.S. Amateur Championship at age 18. But you and I both know people who work very hard. Many work for decades at a job or hobby without approaching greatness. Why don’t they become “world class”, then? It turns out that it’s not just hard work that is required. What is required is focused, consistent practice over a long period of time. Something the researchers are calling deliberate practice. Truly great people in any field devote many hours to deliberate practice. Deliberate practice is an activity that goes beyond repetition. It is consistent practice where the goal is to continually improve performance, reaching beyond your current capabilities, and seeking feedback on results. Simply hitting a bucket of balls is not deliberate practice, which is why most golfers don’t get better. Hitting an eight-iron 300 times with a goal of leaving the ball within 20 feet of the pin 80 percent of the time, continually observing results and making appropriate adjustments, and doing that for hours every day — that’s deliberate practice. 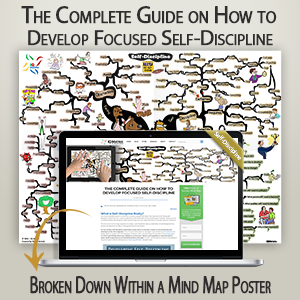 And what’s great about these findings is that we can apply them to all areas of our life. Almost any skill is improvable. Giving presentations. Sports. Negotiating. Whatever it is that you do and have a passion for, you can improve and become truly great — if you are willing to put in the work, that is. Approach each critical task with an explicit goal of getting much better at it. Set goals that are just beyond your level of competency. As you do the task, focus on what’s happening and why you’re doing it the way you are. After the task, get feedback on your performance from multiple sources. Don’t get emotional about it, and make changes in your behavior as necessary. Continually build mental models of your situation – of your industry, your company, your career. Expand the models to encompass more factors. (A good book on the concept of mental models is The Power of Impossible Thinking by Yoram Wind and Colin Cook). Do those steps regularly, not sporadically. Occasional practice does not work. Consistency is the key here. We don’t have to be born with a special talent in order to be great at something. We just have to have the desire to constantly work at and improve our skill. This is huge: it means that you can learn to be good, or even great at nearly anything! Most people won’t go through the long and difficult process of deliberate practice. But this is what can separate you from the pack. This is what makes great performance rare: most people either don’t believe they can do it, or aren’t willing to do the work to become truly great at their passion. So ask yourself, what is your ‘mastery skill’? What should you work on to improve regularly, practicing, getting feedback, improving and pushing yourself to higher levels of excellence? Is it your career? Is it a sport? Is it art or music? Now that you know that excellence is a choice, a whole world of possibilities opens up. Are you ready to pursue your dream and become “world class at it”? When I read something that I really want to remember, I create a mind map to help me conceptualize what I’ve read. 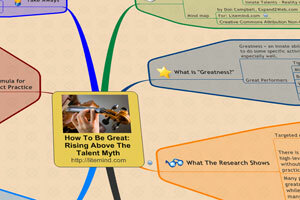 My mind map summary of the article that inspired this post, What It Takes To Be Great, is included below. Innate Talents: Reality or Myth? Don is the publisher of www.Expand2Web.com, a website devoted to helping small business owners automate their business websites using WordPress, and get a steady stream of new customers from Google and Yahoo. In his leisure time Don enjoys learning to play Jazz piano, skiing, and wake boarding. He lives with his wife and two daughters in the San Jose, California where they enjoy traveling and exploring the Redwoods and the Pacific ocean beaches.